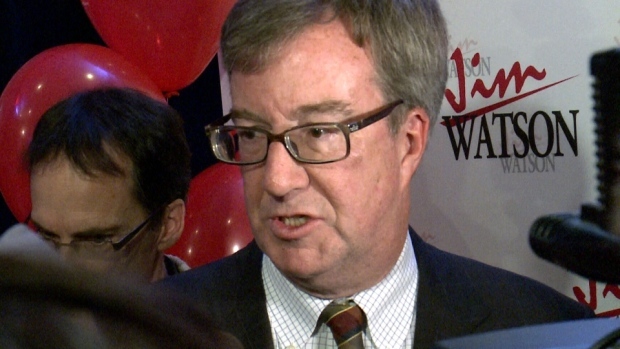 Ottawa Mayor Jim Watson says he’d like more clarity from the Province when it comes to some of the items laid out in the Ontario budget, which was tabled Thursday at Queen’s Park. Speaking on Newstalk 580 CFRA’s Ottawa Now Friday with Kristy Cameron, Watson detailed several items he’d like to know more about. Among them, money for city police to help deal with gangs and gun violence. The Ontario government will be giving Ottawa $2 million, but Watson says it doesn’t line up with what’s being given to Toronto. The mayor says Ottawa and Toronto have similar challenges when it comes to gang crime and gun violence and he wants to be treated fairly. On other files, like transit, Watson says he’s both pleased and disappointed. He’s happy to see the Province’s commitment of $1.2 billion for Phase 2 of LRT, but unhappy with the fact that Queen’s Park will not be doubling Ottawa’s share of the gas tax. Watson says he has asked the City Treasurer to come back with solutions to fill the gap of the planned gas tax increase. He says Phase 2 of LRT is not at risk because of the Province’s move. But one of the decisions the PC government has made, with regard to transit in Toronto, has Watson feeling hopeful for the next leg of LRT. Premier Doug Ford has indicated he wants the Province to take control of Toronto’s subway lines, essentially uploading the cost to expand and maintain it onto the provincial government’s shoulders. Watson says, if the plan goes through, it puts Ottawa on a better footing to negotiate for LRT Phase 3. Watson says he’s still unclear about what the Province has planned for housing, saying the language in the budget is vague. The budget does cut spending on the Ministry of Municipal Affairs and Housing from an interim total of $1.48 billion in 2018-19 to $1.12 billion in 2019-20. Those numbers include the base budget for the Ministry as well as time-limited investments, the latter of which sees the biggest drop. It’s another file Watson says he hopes to meet with the Minister about to get more information on what to expect. “We just need [money] to keep flowing down to us because we’re the ones that do the building of the housing,” he says. The mayor says Provincial changes around liquor laws are not a big priority. The budget lays out a plan to give municipalities the ability to allow drinking in public areas like parks, but it’s not something Watson says he’d support. Watson says city councillors are welcome to bring forward motions to change by-laws to allow drinking in local parks, but he would not support those motions. “On the list of a million priorities, it’s probably down at number one million,” he says. Watson says one of his other concerns with the budget is how it will affect health care. The budget calls for the establishment of 10 regional public health entities and 10 new regional boards of health with a single common governance model by 2021. But the mayor says, again, it’s unclear how it could affect Ottawa Public Health. Watson says, as with all budgets, “the devil’s in the details” and he’ll be awaiting greater clarification in the coming days and weeks.